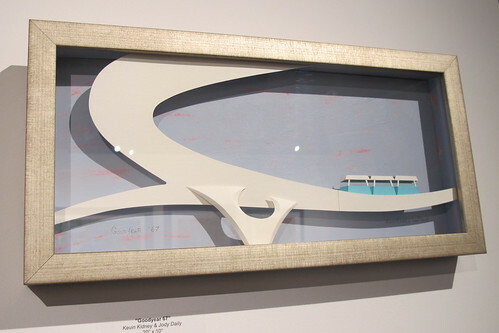 In conjunction with Palm Springs Modernism Week, M Modern Gallery presents a group art exhibition. 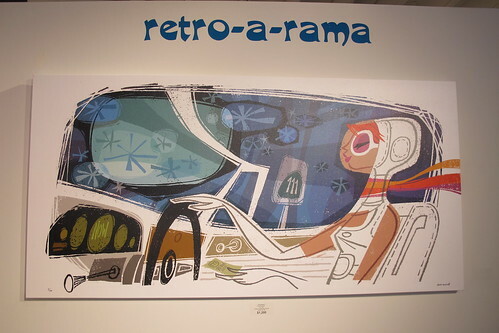 Last year’s “The Contemporary Idol” had a tiki theme, while this year’s “Retro-a-rama” skewed more mid-century modern. Some submissions, like “Episode 9” by Glenn Barr (above) and “One Eleven” by Chris Reccardi (first image), went for a futuristic style that I was digging. 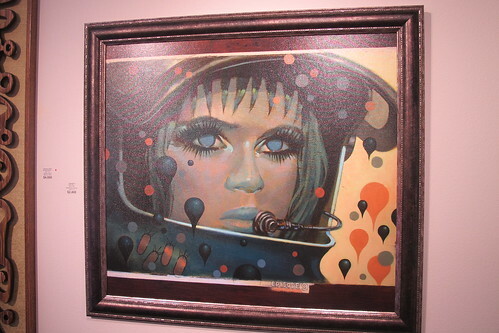 Other featured artists for this show included Tim Biskup, Lynne Naylor, Bosko and, my personal favorite, Shag. 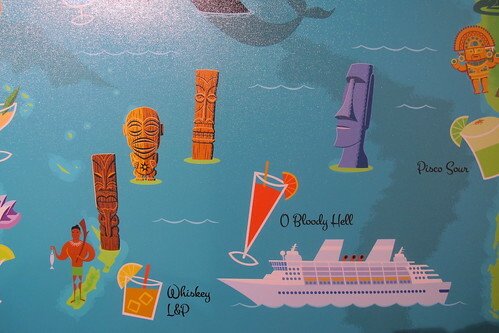 I was also pleased to find two paper sculptures from Kevin Kidney and Jody Daily, who create awesome art and collectibles for Disney (recently the 50th anniversary of the Enchanted Tiki Room). It’s fitting that they would find inspiration in Tomorrowland and its Utopian vision of the future from a mid-century perspective. I loved the sweeping lines in “Goodyear ’67” — named after the company that sponsored the PeopleMover. 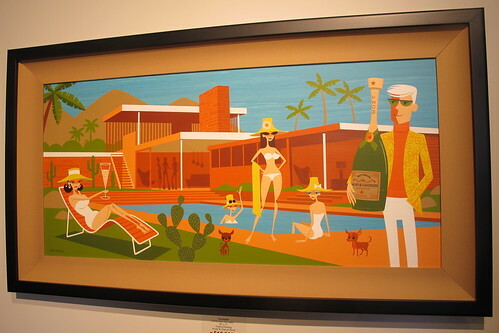 It took me a second to realize the setting for Shag’s painting “The Refill” was the Kaufmann House, a Palm Springs local landmark designed by Neutra we’d seen last year on the Modernism Week architecture bus tour. 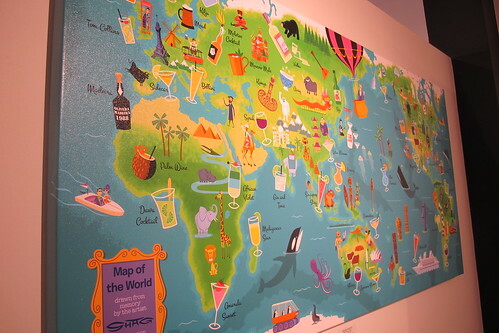 “Drawn by memory from the artist Shag, based upon his travels of Planet Earth,” it amusingly matches signature cocktails to their cities and countries…Mai Tai to the Bay Area (for Trader Vic’s), Blue Hawaiian for Hawaii and so on. 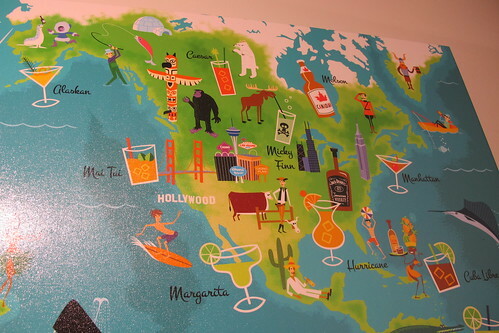 Shag’s web site has a larger, detailed version. 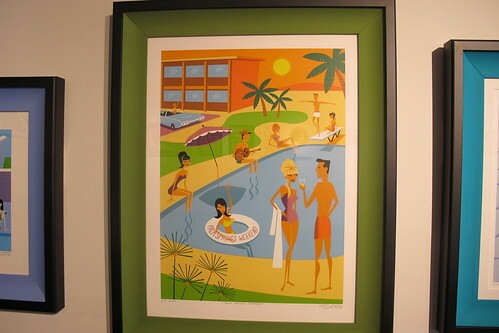 Well, that’s a wrap for our “Palm Springs Weekend” — hopefully we’ll be able to come back next year for some more fun in the sun and mid-century modern merriment.